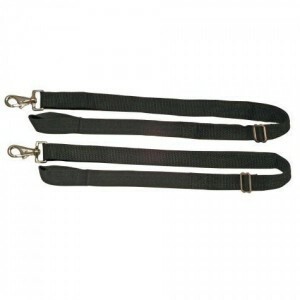 Black nylon snap clip spare leg straps. Sold as a pair. How to fit Weatherbeeta leg straps. 1) Attach one end of each leg strap to the dee ring positioned on the inside of the rug/blanket at the rear surcingle. 2) Pass the leg strap through your horse's hind legs and attach to the dee ring positioned at the rear of the rug/blanket on the same side. 3) Ensure one leg strap is linked ( or threaded through) the other between your horse's legs to help keep your rug/blanket securely in place. 4) To ensure the best fit, a hand's width should be left between the leg strap and your horse's leg.